Mars is drowning in chaos. A separatist faction of Marauders—intent on wiping out the Martian colonists—has destroyed the terra-formers and sparked a decade-long war that has rendered the planet’s surface uninhabitable. Forced to rebuild their society underground, the colonists cling to whatever hope for survival they can find. Deep inside the planet, an ancient alien stronghold is uncovered… and Armageddon is unleashed. A vicious alien race—locked away for millennia—will stop at nothing to cleanse the planet of life. 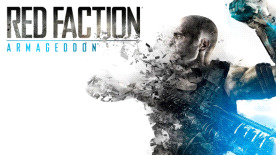 As demolition expert Darius Mason, the grandson of Alec Mason who defeated the Earth Defense Force years ago, the Red Faction looks to you as leader, defender, and salvation. Harness the destructive powers of the Nano-Forge to transform the world into your weapon and bring it crashing down upon your enemies. The fate of Mars lies with you. Red Faction: Armageddon expands on the critically acclaimed science-fiction franchise, building on the events of Red Faction: Guerrilla as well as the upcoming Syfy channel live-action movie, Red Faction: Origins. Your journey will take you from the frozen poles to the molten core of Mars as you wage war against the Red Faction’s greatest enemy yet. Combat alien invaders with concussive blasts, core-shattering tremblers, and bone-crunching rhino charges. Tear down separatist outposts, rip apart alien monoliths, and reconstruct colonist defenses with the most advanced real-time destruction engine to date. Stomp through barricades with a six-legged mech and crunch enemies beneath your fusion-powered tank.